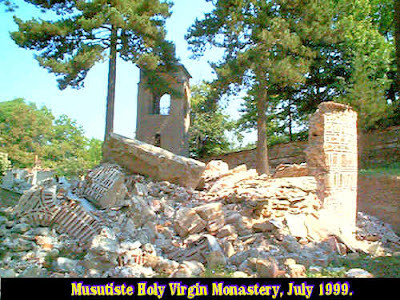 As an Orthodox Christian and being politically conscious, I was aware of the constant run of muslim attacks on the Christians of Kosovo, rapes of nuns, assassinations of priests, etc, which began shortly after the fall of the Soviet Union. The Christians of Kosovo were in shock. They were saying of their Muslim neighbors, "Here are these people we have known for decades, who's children went to school with our children. We have been peaceful neighbors for ever and it is as if they have gone mad." 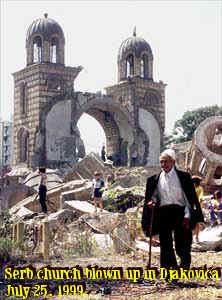 The Christians in the years of Communist Rule became ignorant of Muslim ideology. The Muslims operated a Civilization Jihad against the communists, becoming party members, spying for the West, forming friendships with the enemies of the Soviets. When the cold war was over, the time to "strike" was now, and they did. The Serbians were painted as butchers for not laying down and handing all of the former Yugoslavia to the Muslims. 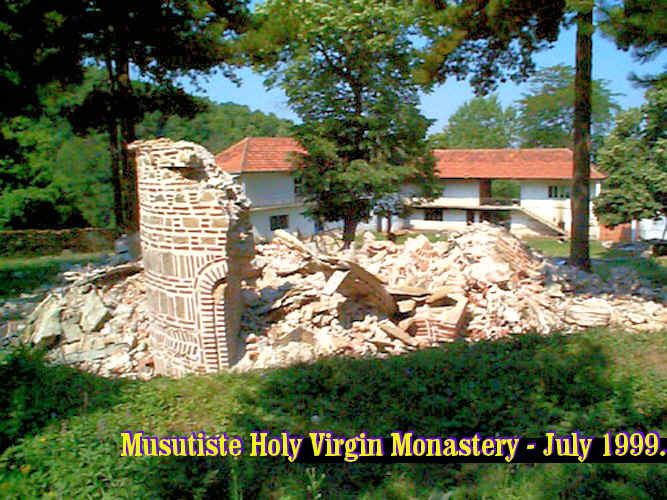 I was in contact with a priest, monks and one bishop who lived in Kosovo. Early in the 1990s we were active trying to get the State Department to listen to the reality of the situation. 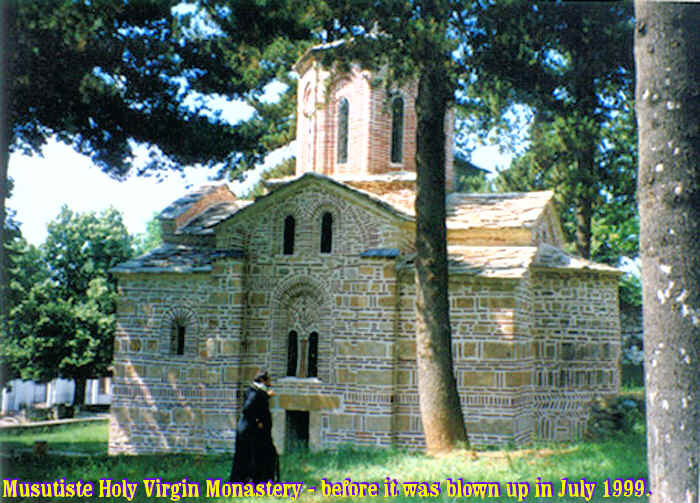 The Kosovar bishop and one priest came and walked the halls of congress, gave testimony before congressional committees. It was a big waste of time because the New World Order had already decided that they were going to give Kosovo to the Muslims and make it for all practical purposes, Greater Albania. My fellow Americans were so ignorant of world geography and geo-politics they were clueless what was happening. When Clinton began to bomb, a good friend who had been a NATO operative since recruited as a young boy in the early fifties, leaked to me information that the refugees fleeing Kosovo in fear of the horrible Serbs, were fakes. It was a staged kabuki play for the international news media. I had noticed that they were the most well groomed best looking refugees I had ever witnessed. Day after day, they all looked like they had showered that morning - clean clothes, pooffy hair, makeup, not a sweat drop among them. It was a big wag the dog campaign - I published the information on our church website - the website was taken down by the government, I was warned to be silent and my friend who had leaked the information was assassinated in Europe - this was all within the first two weeks of the Kosovo invasion. My friend's widow returned to the states, shell shock. She suffered the loss of her mother in the states and husband in Europe, on the same day. I was still working as a prison chaplain and I was devastated. The opposite of Michelle Obama, I was ashamed of my country for the first time. As it turns out we were fighting in Kosovo allied with the Kosovo Liberation Army (KLA) which was nothing short of Alqi'ada and the rumor persists to this day that Osama Bin Laden was in country directing his minions. I arrived at prison grief stricken, shell shocked, angry, feeling the powerlessness of it, like futility and death were dancing in my head. 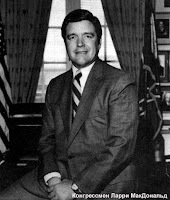 Prior to that week, I hated our nation's abortion law, but it was a philosophical hatred; that week seeing the carnage, the death of my friend, suddenly the millions of abortions became personal as well and for the first time in my life I was conflicted between what I knew to be right on a gut level and the actions of my country's government AND the attitude and ignorance of the American people - most bowing to the Idol that said, "We really don't have to worry about much. Our government is good and has the blessing of God." - this is a damnable lie, and one for which we have paid a very serious price. The complete gutting of the Bill of Rights, the voiding of the constitution and the slavery of internationalism. General Wesley Clark, NATO high commander and other terrorist leaders of the KLA. There is massive blood on that pile of hands. 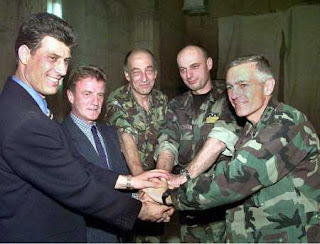 Hashim Thaci, UCK (KLA) leader - Terrorist- Alqui'ada In Kosovo - Thaçi became prime minister of a provisional government for Kosovo, to rule until elections could be held. Agim Ceku, Commander of KPC; - Terrorist Albanian Muslim head of the so called Kosovo Protection Force that regularly attacked Christians -and are still at it. Gen. Wesley Clark, NATO Commander. Clark's presidential ambitions cut short by the revelation of his links to the KLA and thus Alqi'ada. Even today July 2012, ignorant people talk about God "just now taking his blessing from our country" or if we don't do X or Y God will remove his blessing." They are clueless. God's blessing has not been with this nation for decades as the people lived drunken lives of conspicuous consumption and dug deeper and deeper into pagan hedonism, some of it covered over with Christian labels. Satan has conquered most of the mainline protestant and episcopal churches, and a large segment of the Evangelical churches, which have simply apostatized losing all tie to the Ancient Christian faith. I can't gloat because Roman and Orthodox Catholicism are on the ropes as well. They blindly allowed evil to take control. That sums up World War Two to today. The so-called Greatest Generation saved us from Nazism, but they returned home only to bow to an Idol, "Blind Faith In The Goodness of Uncle Sam." While they worshipped him, ascribing every goodness to him, uncle Sam turned our country over to the New World Order. 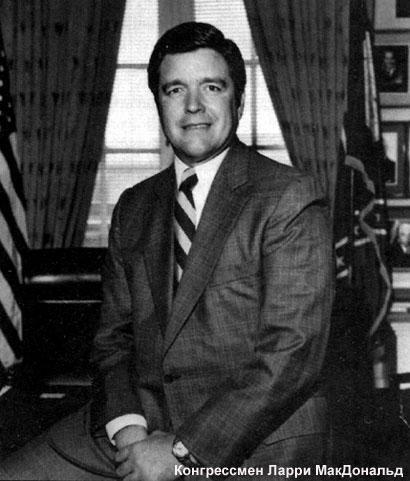 I was fully aware, shocked awake by the assassination of my friend Congressman Larry McDonald. I knew the things McDonald was investigating and I knew who wanted him dead. Here is what I knew in 1980 - it has taken thirty years for millions to catch up - and tens of millions remain blind. What Larry McDonald was saying was TRUE and we are living it now. I expressed my deep grief by saying to a very close friend and the only other Orthodox Christian on the prison compound, "Seeing this, what is an Orthodox Christian supposed to do? My government's actions have been barbaric and worse anti-christian. They are this moment murdering Christians on behalf of Muslim Terrorists in Kosovo and they have taken this policy knowledgeably and purposefully, with eyes wide open. This is INSANE! How am I supposed to react to that?" She did not hesitate, she said, "Sing!" I was taken aback and shocked, she recognized that her answer offended me. I thought instantly that she just didn't believe the horror of the situation or she would not be so trite. Reading my reaction she said, "Go into the chapel, prepare for your liturgy, and sing the psalms and prayers, in a strong voice like you always do. This is what we Orthodox Christians do, we do not let beast or tyrant stop our song, because the power to speak, the power to teach, the power to save this country cannot come from our silence. WE SING. That is what Ancient Christians did in the face of the Roman Tyrants and what we their children do, WE SING!" This nation has been wrong for a long time now. Co-opted by evil from the top, starting in earnest in in 1913, when we handed our economic sovereignty over to a group of international conspirators, (the Federal Reserve) - their utopian plans have been aided by hedonistic blind people herded to the voting booths casting their votes in a pleasure seeking blind stupor - always "what is best for ME" without regard to the implication and unintended consequences of their blindness. Having been awake for thirty plus years now, it has been a little like living in an insane asylum, realizing that only a few are awake and know we are being lead to the slaughter. Now, millions are awake, and in truth it seems too late, but I'm still SINGING the songs and prayers of the Church, and pointing to the beauty present everywhere that contains truth. That landscape painting Icon I used for my blog spot - - I painted on the location in N.W. Georgia during the Kosovo War, I wrote on the wood of the frame, "Were God's children awake and well, all the world would be a paradise." There is no place on this earth, that would not be a paradise, from the worse slum to the dankest swamp, to the showplaces and the mountaintop. It (the world) suffers because WE suffer. Of course I was hearing in my mind those words of Saint John, "Beloved, now are we the sons of God, and it doth not yet appear what we shall be: but we know that, when he shall appear, we shall be like him; for we shall see him as he is." and of Saint Paul's words, "because even the creation itself shall be freed from the slavery of corruption into the freedom of the glory of the children of God. For we know that all the creation groans together and labors in birth together until now." We can't get there if we don't sing and revel in the songs of others. Not every song has to be sacred to have holy purpose. I'm still singing the psalms and encouraging and teaching anyone who will listen, to find the truth and sing. - Lord Jesus Christ, Son of God, Have Mercy On Us Sinners. Don't you long for the glory days, when in a hypnotized stupor you could say, "These people are nutz, Uncle Sam has our back, our government is good and would never do anything to harm us." Thaçi, Hashim, born 1968 in Burojë/Broja in Drenica. Prime minister of provisional government, formerly head of UÇK political directorate. Nicknamed 'Snake'. After an agreement reached by the three principal Kosovar Albanian delegates to the Rambouillet peace talks (Thaçi, Rugova, Qosja), Thaçi became prime minister of a provisional government for Kosovo, to rule until elections could be held. Former university student movement leader who in early 1990s joined forces with leaders of the LPK to found the armed movement which became the UÇK in or around 1993. After being expelled from Prishtinë/Pristina university by Serb forces went to Drenica to help agitate among Kosovar Albanians. Sentenced (in absentia) to 22 years in prison for terrorist offences. Fled to Switzerland, where did post-graduate studies in political science in Luzern and Zürich. Returned to Kosovo in 1998 to fight with the UÇK. Although at first enjoyed the support of Western leaders, since the deployment of UNMIK and KFOR he has lost some of that support as a result of the provisional government's attempts to assert its own authority. Krasniqi, Jakup, Minister of Reconstruction and Development. Former UÇK spokesman, and a member of UÇK political directorate, but originally from an LDK background. Born 1951. History teacher and former local leader in town of Qirez, Drenica region. Former political prisoner. Close ties and family loyalty with Thaçi and Thaçi's uncle Azem Syla (q.v.). Nonetheless has become distanced from Thaçi against whom he was a rival candidate for political leadership of the UCK at Rambouillet. Syla, Azem, Minister of Defence in the provisional government. Nickname 'The big uncle' (Daja i Madh), apparently because he is Hashim Thaçi's mother's brother. 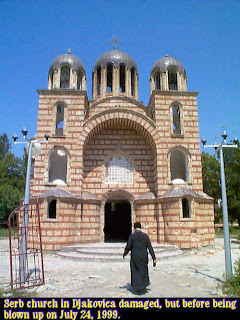 From Açareva in Drenica. Based partly in Albania during the war where helped funnel arms from abroad to the UÇK in Kosovo. Mahmuti, Bardhyl, President and founder of PBD (Partia Bashkimit Demokratik - Democratic Union Party). Born 1960 in Macedonia, came to Prishtinë/Priština in 1972. Imprisoned 1981-88 after anti-Belgrade student protests (see Hyseni, Kosumi etc). Lived in Vevey, Switzerland from 1990, first as a leader of the LPK, then francophone spokesman for UÇK. Studied political science at Lausanne, still working on a doctorate. Haliti, Xhavit, - nickname 'Zeka'. Logistics and finance man for UÇK, Haliti left Kosovo in the 1980s, and has been based in Switzerland, where initially he was active in the LPK. Reported to have used great creativity and enterprise to acquire arms for the UÇK from various sources, including allegedly the Irish Republican Army, Israeli Mossad, and Germany. Was a member of UÇK political directorate. Buja, Ramë, minister of local government in provisional government. Member of the UÇK political directorate during the war, and Director of UÇK Civilian Affairs. Economist. Former member of the LDK presidency, later left to join Qosja's LDSh. Was also in the LPK. Shot four times by Serb forces during NATO air strikes. From Hani i Elezit, on the border with Macedonia. Grabovci, Adem, appointed minister of finance in provisional government, an economist from Prishtinë/Pristina. A recent UÇK incomer from the diaspora. Demaçi, Adem, called the "Nelson Mandela" of Kosovo because of the 28 years he spent as a political prisoner in Yugoslavia until amnestied in 1990. Awarded the Sakharov Prize in 1991. Born 1935. Founded the Council for Defence of Human Rights and Freedoms in 1991 and became its first President. Editor-in-Chief of the magazine Zëri 1991-3. Joined the PPK in 1996 and became its president shortly afterwards, until leaving in late 1998 for the UÇK. He was the "general political representative" of the UÇK, and his visit to Albania in January 1999 is regarded as responsible for a rapprochement between the Majko government and the UÇK. He negotiated for UÇK at Rambouillet but resigned on 2 March in opposition to the agreement - he insisted on a binding referendum after three years to determine Kosovo's future. After Rambouillet Demaçi was accused of trying to orchestrate a hard-line coup within the UÇK, by naming Sylejman "The Sultan" Selimi (q.v.) the supreme UÇK military commander, and denouncing political decisions taken by UÇK political leader Hashim Thaçi as illegitimate - for example he opposed the establishment of the provisional government. By now it seems his influence on the (generally much younger) UÇK leadership is limited, and that there is a significant gap between his politics and theirs. Spent the entire war in Prishtinë/Priština. A fierce, uncompromising proponent of independence for Kosovo, but also upholds tolerance and the right of Kosovo's ethnic minorities to stay. Selimi, Rexhep, Minister of Public Order in the provisional government, born c. 1972, an early member of the UÇK together with with nephew Sulejman (q.v.). In an interview with the Kosovo Albanian weekly Zëri, Rexhep Selimi said his activities with the UÇK began as early as 1993. Rexhep Selimi was among the first to proclaim public allegiance to the UÇK, appearing in military uniform at the funeral of the activist teacher Halit Geçi on 28 November 1997 in Llaushë/Lausa near Skënderaj/Srbica in Drenica - this was indeed the first public sign that the long-rumoured UÇK in fact existed. When KFOR troops stopped his car in Prishtinë/Pristina on 4 August 1999 (for carrying a flashing blue light), Selimi was reported to have threatened them with a weapon. Two days later KFOR searched a house and found Selimi and some colleagues with weapons and large sums of money. He later issued a conciliatory statement. Sejdiu, Pleurat, born 1963, orthopedist from Llap. Sejdiu has been based in London since 1993, and served as the UÇK's spokesman in Britain. One of the founding members of the new PBD. A former member of the LPK in Llap. Sherifi, Bilall, Chef de Cabinet and chief adviser to Hashim Thaçi (q.v.). Spent some time in prison under the Belgrade regime.